Embrace this opportunity to meet Impressionist artist Kerry Hallam at a special exhibition featuring original paintings on canvas, nautical charts and hand-signed, limited edition graphics. Acquaint yourself with this outstanding collection of dramatic new work. It is with great pleasure that Martin Lawrence Galleries Presents Impressionist artist Kerry Hallam at two special exhibitions at MLG’s La Jolla and Costa Mesa, CA locations. 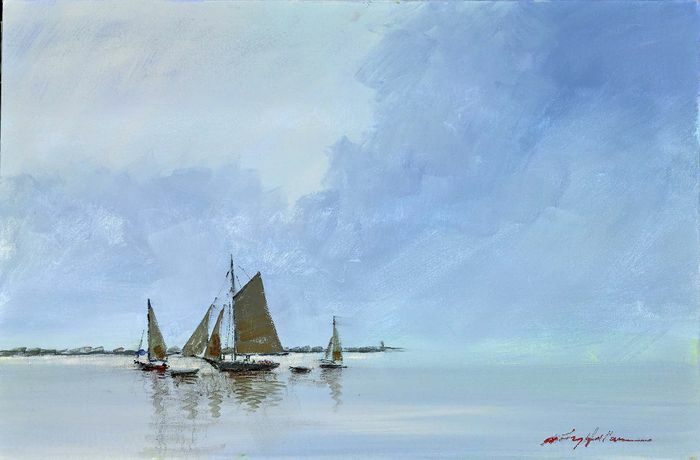 The exhibitions will consist of original paintings on canvas, nautical charts, and hand-signed, limited edition graphics. Embrace this opportunity to meet the artist and acquaint yourself with this outstanding collection of dramatic new work. If the world is a banquet, the paintings of Kerry Hallam are an invitation to sit at the table and join the feast. Hallam's works spirit us away to experience an alluring atmosphere and the simple pleasures of life. Hallam's lifetime of travels has continually called him to the sea, and his paintings are a like a stage-setting, there to be explored. Born in Northern England, Hallam showed early artistic talent when he won a six-year scholarship to London University’s Central College of Art and was formally trained under British master painters. Britain’s Royal Society of Artists in Watercolor included him for his talent. Enthusiasm for his art is sufficiently evident in Kerry Hallam's vivid windswept seascapes and timeless, sun-dappled village scenes. Strongly by the Fauves, Hallam has a strong affinity for the 19th-century French Post-Impressionists, Cezanne, and Van Gogh. "What makes a particular place particularly extraordinary? Sometimes it is the combination of sights, sounds, smells, and feelings. More Often it is an experience that separates this place from many others. Sometimes, though, it is something as simple as the way the sun hits the city buildings as it begins to set, or the sound the waves make as they break upon the shore. To the artist, art is everywhere for the taking. It is a requisite for the soul. It is what makes the ordinary extraordinary. In 1981, Hallam opened a studio and gallery on Nantucket Island. Inspired by St. Tropez and the French Riviera Hallam frequently returns to renew his spirit. Noted for his power to evoke emotion, the opulence of light and distinctive color harmonies, Hallam translates the ordinary moment into the magical, inviting us to be revitalized by the world’s simple pleasures. 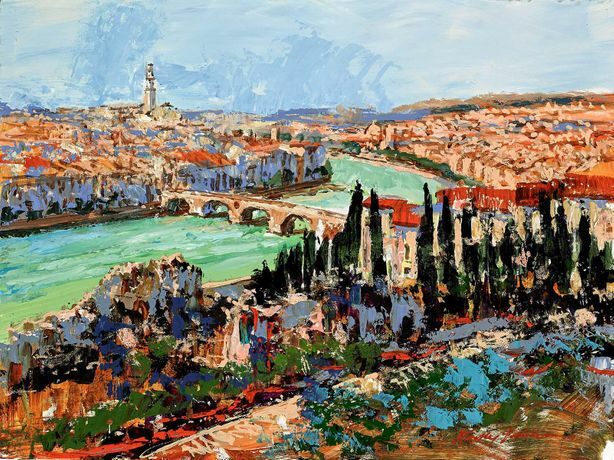 His panoramas continue to draw accolades, including a first-place award by the prestigious L'Association Pour le Promotion Artistique Francais. Hallam has been honored through many one-man exhibitions around the world and at (MLG) 9 galleries throughout North America. His work has been featured in newspaper, magazine articles as well as in PBS television specials.